Pin It Man, I need to stop with all the late postings! I grabbed 5 colors, I didn't feel like I needed the others and the purple looked WAY to frosty for my liking so... Here's are the colors I picked up! Can you tell the difference? Because I can't... and neither could my Facebook Like-rs! Excuse the ring finger dent, whoops! 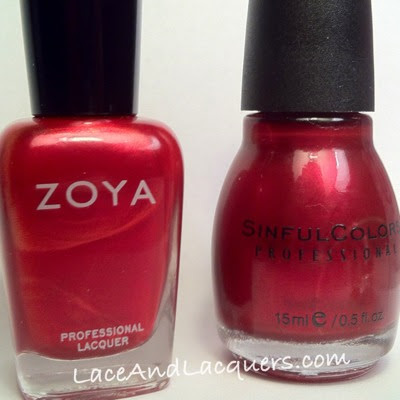 Zoya Elisa is on the pinky and middle finger while Sinful Colors Hot Hot Heat is on my pointer and ring finger. 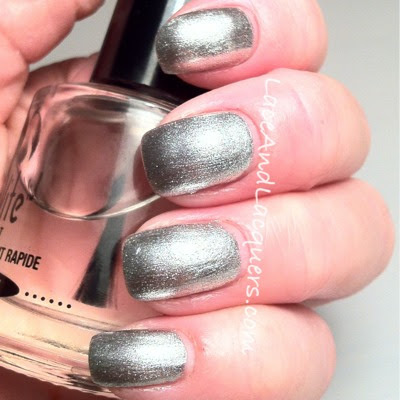 Pretty gosh darn close and pretty dupe-tastic if you ask me! 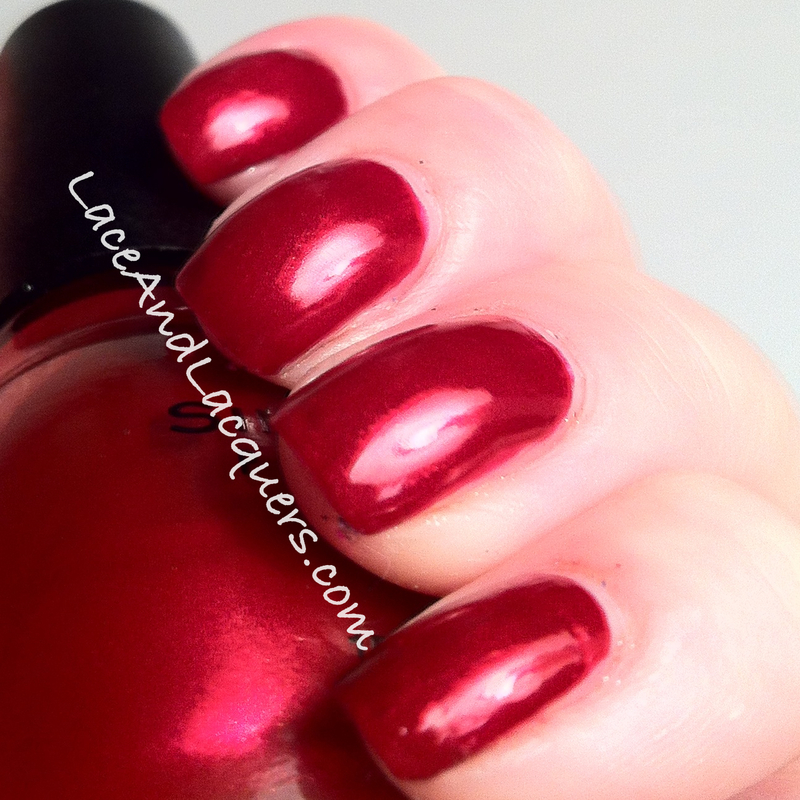 So, if you're lemming for Zoya Elisa, Sinful Colors Hot Hot Heat would be a great substitute. I think this one was the one I was most excited about. I know everyone's loving rose gold colors right now, how can you not? Super Nova is a rose gold, metallic, shimmer. Very pretty color, especially when it hits the light! 2 coats, no issues! I find Hot Wired to be a blue-toned grey, metallic, shimmer. It's not a true blue or a true grey, at least that's what I can see... when I grabbed it I thought it was a light blue bahaha! 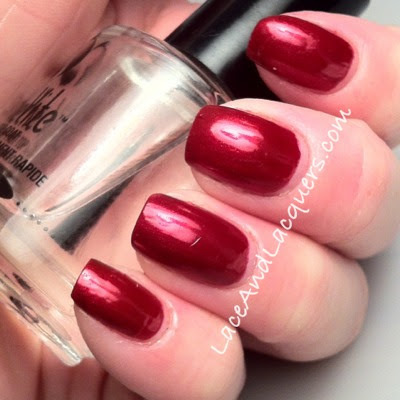 A very unique shade, I can't compare it to anything I have. This did take an additional coat in comparison to the others but, looked great after the 3rd coat. No issues here either! I keep thinking this would be good undies for Zoya FeiFei, I'll have to try it one day! You ALSO might of saw this on my Facebook haha. 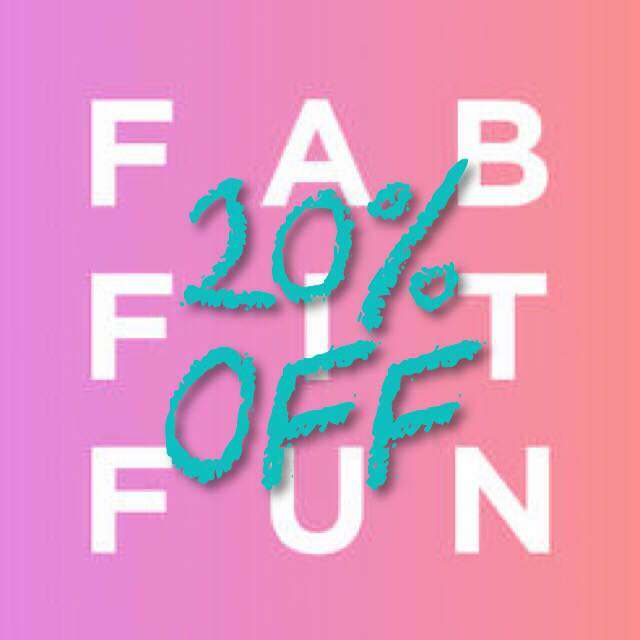 I knew I wouldn't have this post done for the sale but it's still good to know! Zoya Trixie, pinky and middle and Sinful Colors Heavy Metal, pointer and ring. Yup, there ya go! A darn good dupe! So if you've been lemming after Trixie, Heavy Metal would be a good replacement too! I got these polishes from Walgreens, their Sinful Colors are usually $1.99 but I grabbed these during a 99 cent sale! 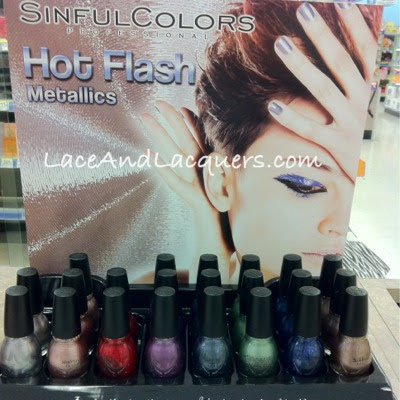 I know Rite Aid, Target and some Walmarts also carry Sinful Colors polishes. I haven't seen the displays for these yet, but thank god for your reviews. I think I'm gonna pass on these. awww, you don't like them?? Great post! Really useful dupe info. and great pictures! Oh yay!! I got a dupe for Zoya Trixie!! I have been wanting Trixie for a while. So thanks for that!! I passed on the red because I didn't hink I really needed ANOTHER red. I really shouldn't have. 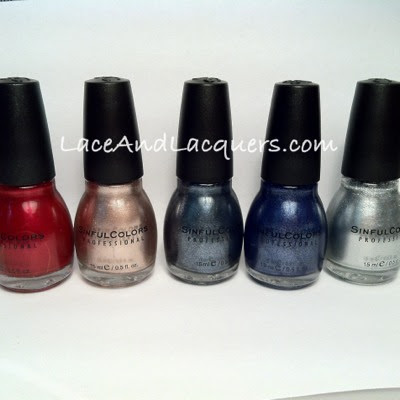 *sigh* I really love all of these metallics but haven't had a chance to try them out yet! Nope I do not, I only have the Miami Spirit one. Commented on yours ;] Glad you got the Trixie dupe! They're awesome colors! I was going to get Moss Have but I have a color club super similar, haha IDK why I didn't grab it if I have 2 dupes LMAO! But YES! LOVE Super Nova! HEAVY METAL:= awesome color! Thank you for the swatches, very helpful. 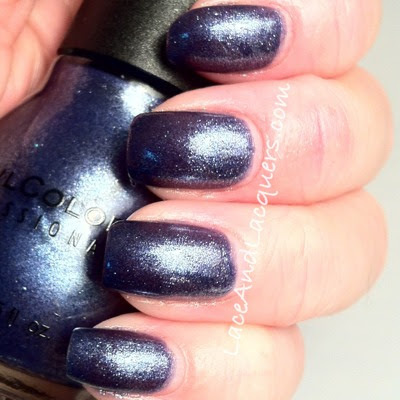 Heavy Metal and Super Nova are stunning, great swatches by the way. hehe I've picked up a couple of those I haven't tried yet. So many polishes, so little time! !